Both my kids love yogurt, and I love that yogurt contains the nutrients like calcium, protein and vitamins that their bodies need. Yoplait Kids wants to encourage children to develop healthy eating habits so that they can grow up "Strong and Happy." They are currently sponsoring a “Strong and Happy” Drawing Contest together with 5 Minutes for Mom, and the winners will receive money to pay for classes or educational materials (First Place: $1000; Second Place: $300). My preschool-aged daughter (4YO) loves to draw just as much as she loves eating yogurt! Here's her contest entry. 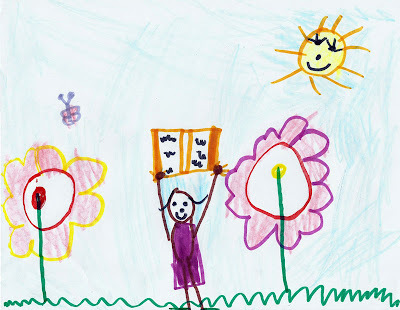 In her drawing below, she's happily using her strong muscles to hold a large book over her head, while standing in a field of unusually large flowers. Yogurt feeds not only the body but also the mind, helping to grow a strong imagination! What an awesome picture--I LOVE it! What a great contest--thanks for sharing. Love the picture! ;D Great idea for a contest I *LOVE* Yogurt myself. Such a cute picture. I found your blog via comment-fest and was excited to read the earlier post re: The Twelve Days of Christmas in various states books. We add to our special Christmas book collection every year. Oh I love the Sun's eyelashes :o) wish mine were long like that, wouldn't need mascara! Thanks for sharing this picture and the contest information. We may have to investigate further having some upcoming educational expenses. Cute and colorful! My kids love yogurt, I'll look into the contest!